One of the hardest things people have to do in life is move on. Whether someone’s significant other broke up with them or someone close has passed on to the next life, the emotional pain can be unbearable. People search for many ways to deal with the pain, but not everyone is able to accept it and move on. Danielle Fewer of Haddonfield, NJ has found her way of moving on. In the state of New Jersey, the legal age to get a tattoo without parental consent is 18-years-old. At 20-years-old, Danielle already has five. With five tattoos and counting, Danielle is no stranger to the tattoo gun. 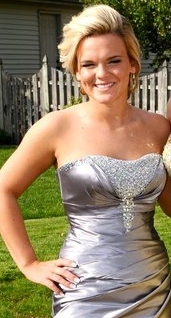 Her artwork is placed across her heart, wrists, and left shoulder blade that will last a lifetime. With no end for permanent art in sight, I got in touch with Danielle this week to talk about her pieces and why she decided to get them. Q: Describe your tattoos and where they are on your body. A: I have my biological mom’s initials with her birth and death date across my heart. I never met my mom, so this was my way to honor her because she is my role model. 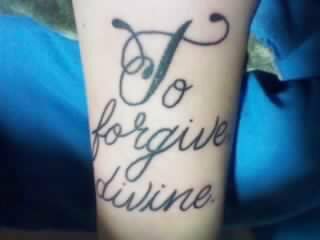 I have “To err is human; To forgive, divine” on my wrists because i went through some really tough times when I was 12-13 years old and the only way i could “get over it” was by forgiving him. I heard this quote in the middle of the whole ordeal and it always stuck with me. I have “strength” with an infinity symbol around it below the “To forgive, divine” because being strong has been the only choice I’ve had to deal with what I’ve had to deal with in my life. This tattoo is a reminder for me to be strong when it seems like I can’t be and it takes a lot of strength to forgive someone. 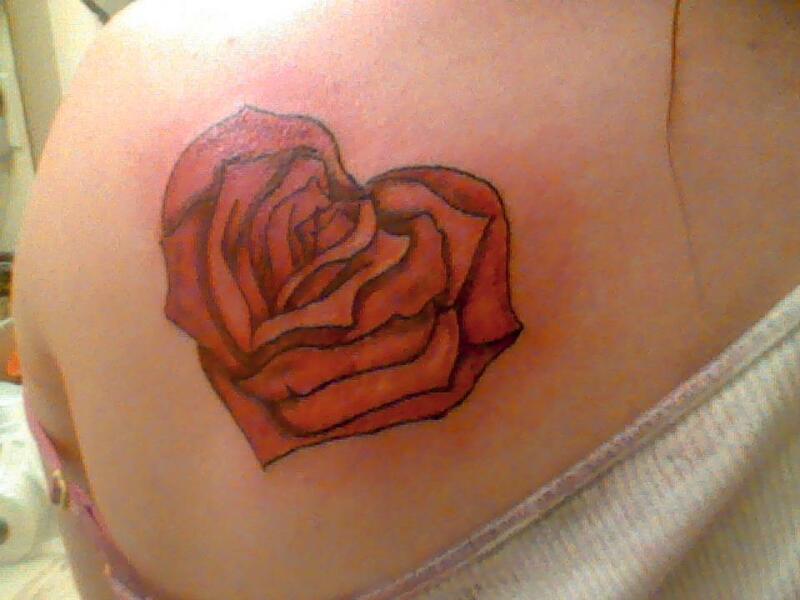 Lastly, I have a red rose in the shape of a heart on my left shoulder blade to honor my mom because she had a tattoo of a red rose on her left shoulder, which was her favorite flower. I added the shape of a heart because even though I never met her, I will always love her. Q: Where did you get your tattoos done and how long did they take to do? A: My tattoos were done at Body Graphics in Philadelphia, Body Art in Stratford, NJ, a friend of my girlfriend’s, and a tattoo party. 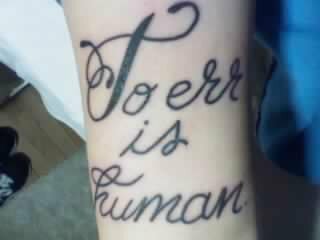 My “To err is human; To forgive divine” tattoo took about a half hour to complete and my “strength” tattoo took about 5-10 minutes to finish. My Mom’s initials and birth and death dates tattoo took about a half hour and the red rose tattoo took about two hours to finish and it was the most painful out of the rest of my tattoos. The cost of each tattoo ranged from around $30 to atmost $200. I definitely want another tattoo on my upper arm, but I was also thinking about getting one on the back of my neck, on my ankle, or behind my ear. Q: How do people react to your tattoos and has your opinion changed about them? A: People do not really react to my tattoos in a positive way. They usually get annoyed that i choose places on my body for tattoos that make it difficult to cover up for work, like my wrists. The only change that I would do if I could have them done all over again would be the placement of each tattoo because it is frustrating and difficult to try to buy clothes for job interviews and always having to wear long sleeves if I was offered the job. Q: Do you have any advice for people looking to get tattoos? A: My advice to people tattoo shopping would be to make your artwork meaningful and always go to a professional. Getting a tattoo from a friend or at a tattoo party is cheaper, but you get what you pay for. This week, I interviewed my 18-year-old cousin Kimberly Nicole of Delran, New Jersey about her first tattoo and what it means to her. 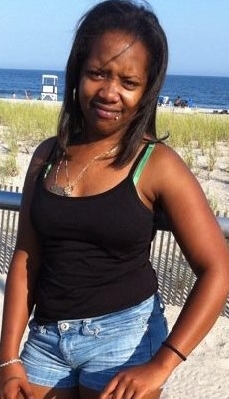 She is the party supervisor at The Funplex and currently studies at Burlington County College. She had a first tattoo done April 22, 2010 on her eighteenth birthday, an age where some people think is too young be getting something done that will be there for the rest of her life. Q: What is your tattoo of and what does it mean to you? A: I drew my tattoo to symbolize my life up until my 18th birthday, and to show what I have become. The vein is in the shape of a heart and starts as nothing and turns to a beautiful flower and the leaves are the main people in my life. It may seem corny to some people, but that is what they symbolize. I got my tattoo on my side because it wouldn’t be seen very easily, and because I thought it was cute to have there. Q: Where was the place you got your tattoo done at and how long did it take? A: I had it done at Body Graphics in Cherry Hill, NJ and I think the guy’s name was Chris, but I’m not sure. My tattoo took a little over an hour, but it wasn’t too painful. Some of the shading was an irritating but not unbearable and I do not have a high tolerance for pain. It was pretty expensive, I believe it was over $200. It was my mom’s birthday present to me. Q: Do you plan on getting any more tattoos, and if so what are your ideas for them? A: Well I only have one so far, but I am considering another one maybe one day. I’m thinking something done on my foot, maybe a saying or another daisy in a different design. My dad was very upset when he found out about it, so maybe I’ll wait a little while before I get another one. He likes it now, though. A lot of people see it and know that I drew it, so they ask for sketches of their ideas. It’s pretty cool, actually. A: Make sure you know what you want and have a good sketch. Think about it and don’t do it right away, give it time and see if you still want it a month after you draw up an idea. 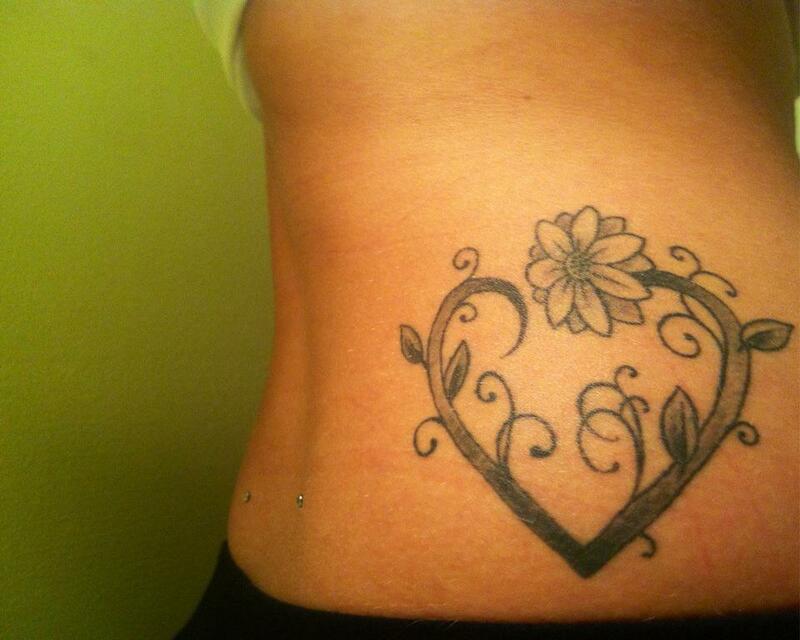 I loved my tattoo when I got it and still do. Every time I look at it I smile. For the most part, I have discussed and shown pictures of tattoos that people wanted to get and still loved to look at even after years of having them. That is not always the case with other people’s tattoos. Neah Wilburn is a senior RTF major at Rowan University with a total of four tattoos. She received her fourth tattoo on her right hand in March of this year, and only eight months after it was done she already wishes she could change that tattoo if it were possible. I met up with her on Monday to discuss this particular tattoo, and why it is controversial to her and to other people who see her tattoo. Q: What is your most recent tattoo of and why did you get it? 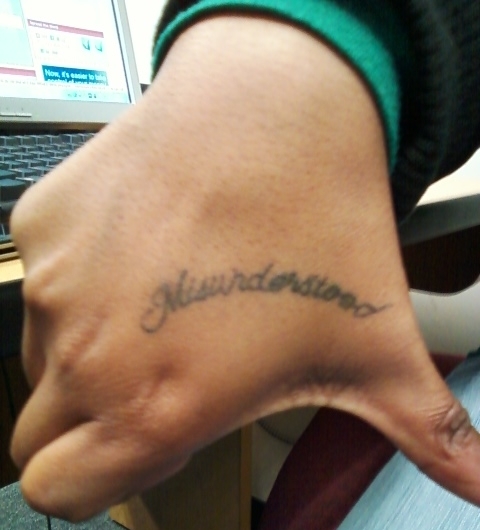 A: My tattoo is in cursive writing of the word, “Misunderstood.” I got that tattoo for many reasons. The first reason is my best cousin and I have the same tattoo, she’s like my partner in crime. Second, my cousin, who I also call my twin, has a small thunderbolt on his forehead representing the word, “Misunderstood.” The third reason is because I honestly feel like no one understands how I feel or the way I think. Lastly, I also got it because it was only $15 to get it done. Q: Where did you get your last tattoo at and who did it? A: A family member’s friend did it in his bedroom because he wasn’t licensed to tattoo. I am not allowed to say his name because it is illegal for him to tattoo and it is also illegal to have a tattoo done outside of a shop or a tattoo convention. Q: How did your family feel about your tattoo? A: They wanted to kill me. My mother not only didn’t like it because of her beliefs about tattoos but also because it was visible. My one older cousin who I looked up too didn’t like it because it was so visible and couldn’t be covered easily without it being noticed. My father still tries to wipe it off everyday thinking it’s just pen ink and not permanent ink. Everyone thinks I was stupid to get this tattoo, which is why I got it in the first place: they don’t understand how I think. Q: Do you regret your tattoo does it affect your life? A: I do not like the format of my tattoo. The “e” and the “r” in the writing look like they are melded together, making it hard to read. People can barely read it and understand it, just like myself. This particular tattoo makes it more difficult for me to find a job. If I were to be offered a position, any job would want me to cover it with a band-aid or with make-up so no one will see. My employers would see my tattoo as unprofessional. Q: Why is your tattoo controversial? A: It’s controversial because everyone is misunderstood, they just didn’t have the words permanently tattooed on their hand like I did. No one understands how a person thinks or feels, so shouldn’t everyone have my tattoo?